Since the addition of the CiviReport component, we were thinking it would great if users could expose their reports on the CiviCRM Dashboard screen. Hence we decided it's time to redesign the CiviCRM Dashboard ('Home' page). 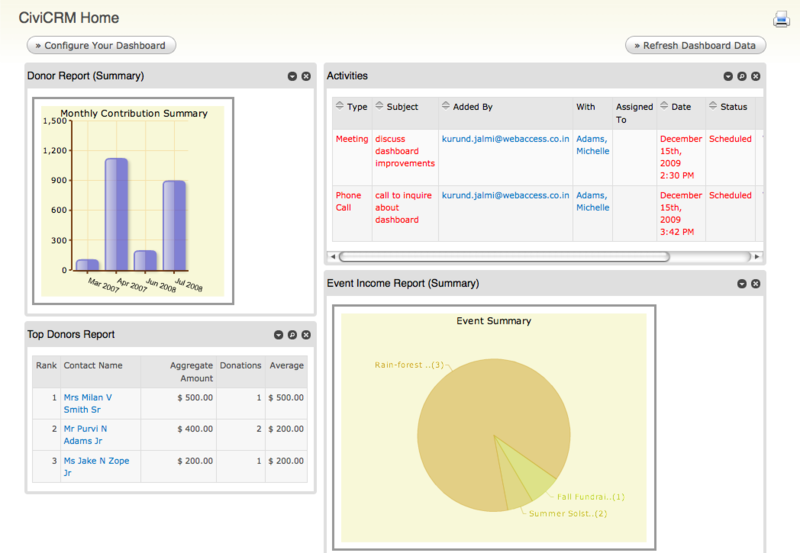 Now it has a 2 column layout with the ability to add reports as 'dashlets'. We think this will be a significant usability improvement, and we've added it to upcoming v3.1 release. This feature will be available for download as part of the next v3.1 beta release. 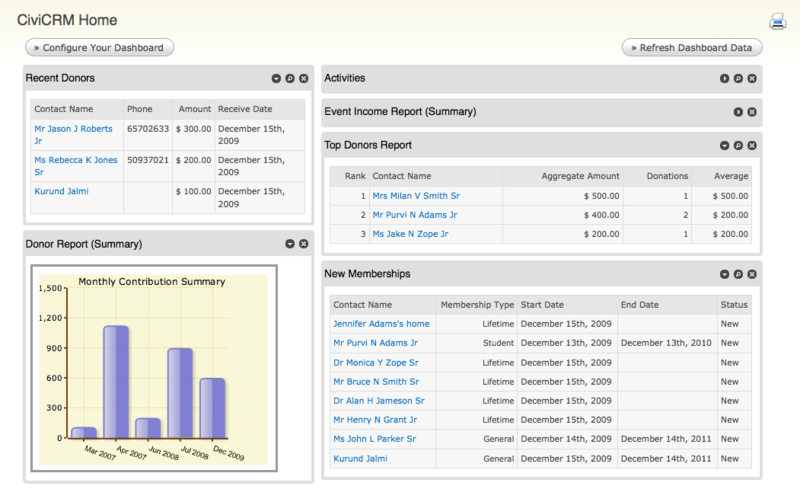 New user friendly "Drag" n "Drop" interface to add/remove/rearrange dashboard elements ('dashlets'). Ability to add any report instance - with either Tabular, Bar Chart or Pie Chart view. Dashboard is personalized - Each user with CiviCRM access can have their own customized version of the dashboard screen. All dashlets are cached, with the ability to manually refresh and an automatic cache timeout period. This is done so that complex queries are not fired for each page reload. We look forward to getting your feedback on this feature in the coming days. If you're seeing a problem and you're not sure if it's a bug - please post your issue to the 3.1 release testing section of the community forums. Include as many specifics as possible about the issue or question. Finally I would like to thank Bevan Rudge for his work on this plugin. This plugin is the base for this feature along with jQuery ui portlets. Kudos to Bevan and the whole core team!. This will really make both CiviReport and the Dashboard so much more useful!! This looks great. Thank you for your work. Navigate to a report instance and verify the report filters and display type (Tabular, Bar or Pie Chart). OR create a new report instance from the Reports menu » Create Reports from Templates. Expand the 'Report Settings' section, and click 'Include Report on Dashboard'. Repeat for each report your want to include on your dashboard. Navigate back to the 'Home' dashboard and click 'Configure Dashboard' again. You can now drag the reports onto the right or left columns and click 'Done' to save your layout. just needed to confirm that the instructions were on screen all the time ie Expand the 'Report Settings' section, and click 'Include Report on Dashboard' Click 'Update Report'. This enhancement looks fantastic. A few questions- Is it possible to customize the dashboard on behalf of another user? Or have some "dashboard" templates that people can choose from or be assigned ( by role would be nice)? It would be cool to "assign" a dashboard to all volunteers, esp those that would not take the initiative to customize their own dashboard. Currently is not possible to customize dashboard for other users. Admin can only make dashlets available for users and they will have to manually drag/drop and customize their own dashboard. Looks fantastic! Thank you for the efforts in continuing to improve CiviCRM.